In the statement, the Board mentions that CAM is taking action in order to serve marginalized populations better. CAM is currently reviewing its own language to insure inclusion of people of all genders. The organization is “committed to providing resources and education for our members” about the needs of trans, genderqueer, and intersex people. I am thrilled to be helping contribute to education on this front by speaking at CAM’s annual conference this November. My session is titled “Some men haveuteruses: a qualitative study about transgender men who experienced pregnancy& birth.” My presentation is paired with one I’m excited to attend by lesbian midwifery clients Jenna Jacobs, a trans woman, and Eby Heller, a cis woman. It will be interesting to see what language they decide on. Last summer I presented at a radical birth conference called Yonifest, held in Quebec, Canada. I was pregnant at the time and fully in awe to be included in such a powerful gathering. Everyone there was deeply committed to exploring and celebrating birth. I presented my own workshop on transgender experiences of pregnancy, birth and nursing, and also spoke alongside the famed and revered American midwife Ina May Gaskin on a panel. After my presentation, I received wonderful comments and insightful questions, and I also saw fear. One midwife recounted how her organization had begun to change the language in its documents to be inclusive of trans and genderqueer birthing people, and she told me, “but I don’t want to erase the word ‘woman.’” She had tears in her eyes and was truly upset. This same midwife had just sat through my two-hour presentation. She was there because she was interested in supporting trans people. She was not dismissive. Now, one year later, in an open letter, agroup including Ina May Gaskin and Katsi Cook (Cook was also present at Yonifest that summer) has written in protest of changes to wording in the core competencies document of the Midwives Alliance of North America (MANA). The letter condemns the erasure of the word ‘woman’ from the MANA document, and also denies the rights of trans and genderqueer individuals to self-identify as they wish and questions their right to receive midwifery care. There is much in the letter that is painful, misinformed and degrading to trans, genderqueer and intersex individuals, points that have been well-covered in a response writtenby another group, birthforeverybody.org. Yet, I don’t want to erase the word ‘woman’ either. I get where these midwives are coming from -- somewhat. Women are a group who have been and continue to be oppressed in many ways by a patriarchal society. This includes women having a terrible lack of control over their bodies during the birth process. This is not about individual patient rights. For many years, one group of people, primarily men who do not have the ability to give birth, has controlled another group of people during the birth process, a group that is primarily women. Women and midwives have worked incredibly hard to try to regain social and legal rights to use women’s knowledge in the birth process. I have deep respect for this struggle. Yet, trans, genderqueer, and intersex people have been giving birth for as long as women-identified people have and they have also encountered oppression. 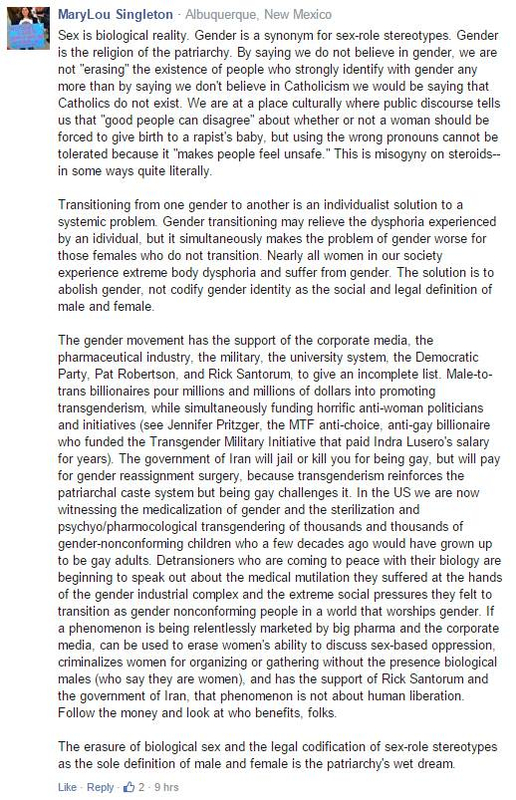 The open letter presumes that to be trans and to give birth is some new phenomenon of the last few years. Trans people giving birth are newly visible because today we are able to transition hormonally and surgically as well as engage our bodies in pregnancy, but there have always been people who identified differently from women whilst experiencing birth. Kathleen Fahy, an Australian midwife and professor, told me at Yonifest that she remembered when her profession changed the language first to providing ‘family-centred’ care, and then later to ‘woman-centred’ care. There was a time when the partner (often a cisgender man) of the birthing parent (often a woman) was not allowed to be present during the birth. Care providers realized that their approach didn’t respect the family unit as a whole. However, shifting to use couple language for everything pregnancy and birth related wasn’t quite right, either. The partner’s body does not give birth, nor does the body of the doctor or midwife. 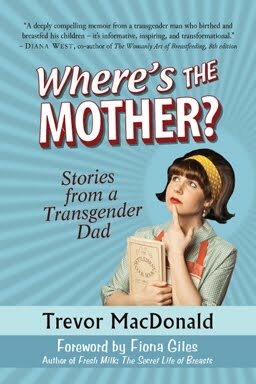 The birthing parent gives birth, and the birthing parent was virtually always perceived as female, although as explained above, trans, genderqueer, and intersex people have been giving birth for as long as anyone. I propose that organizations trying to grapple with respecting the feminist legacy of midwifery care while using inclusive language should be generous with their ink. Use more words! The problem above: the word “woman” has literally been erased from the sentence. The biological wisdom to give birth is innate, it has been held throughout time, and is experienced across cultures by all pregnant women and all pregnant people. Is it wordy? Yes. Is it inclusive? YES! Is it respectful of the struggles of women against patriarchy? I think so. There could even be an explanatory note if desired! The above statement is logically correct, yet to me it is eerily reminiscent of the way some are promoting the hashtag #alllivesmatter in response to #blacklivesmatter. Yes, it is true that all lives matter, but we are focusing on black lives right now because black people are facing racism and violence every day. Women and people perceived as women have faced and continue to face obstetrical violence in the context of a patriarchal society. We do not need to erase the word “woman” from models of care or core competency documents, but we should add more words to include everyone. If there are people who want to be referred to as women in the context of birth, such self-identification needs to be respected. I believe those who wrote the Open Letter feel that they as women are made invisible by the exclusive use of the words “pregnant individuals.” They fear a future where they will not be allowed to write or speak about women in their own practices. For some, becoming pregnant and giving birth is a crucial aspect of their womanhood, not their personhood. Queer folks have done well to add more letters to our “alphabet soup” LGBTTQIA acronym. We can all handle a few more letters. 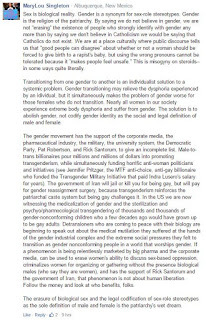 The Open Letter to MANA contains many factual errors and offensive statements regarding trans and genderqueer people. I see there is much work to be done. I want to see two communities that I love, the radical birth world of traditional midwives and womyn, and the LGBTTQIA birth workers move forward together. I will always love and respect Ina May Gaskin’s work. I hope I will meet her again one day and be able to continue this conversation.